Joan Didion is a prolific writer of the authentic American experience. In university, I wrote my honours paper on Didion, so had the opportunity to read all of her works, some of them several times. Despite this, I was always newly struck by her powers of description, and her ability to convey so much with so very few words – the quintessential sign of a natural born writer. We typically tend to forget specific details about books we read; we are merely left with an impression or feeling about the work, whether it be positive, negative, intrigued or bemused. Although I never wrote a paper about Run River, it was a book that always left an impression on me. The feeling is somewhat indescribable (if only I had Didion’s way with words), but the book always conjured a dark, country road meandering alongside a river, an ominous feeling in the air. I could see car headlights on that road, or shining deep in that river. Ten years later and I pick up the book again, to find out more about this car and this river, and why it made a difference to me as a reader. Written in 1963, but set in the 1930s-50s, Run River pivots around the story of Lily McClennan, and how her many trysts get both her and her marriage into trouble. It also touches on the history of California, both Lily and her husband Everett having descended from pioneers, their families made wealthy by land ownership and farming. It is a time of religion and racism, and in the background the sense that California, the land of milk and honey, can fulfill the American dream. However, this dream is overshadowed by disloyalty and dysfunction, and the idea that what one has is never good enough. There is the looming possibility of breaking with tradition and selling the family farm to larger shareholders; Everett is “fighting the war” in Texas instead of helping his family; and intelligent, good looking Martha, Everett’s sister, can’t seem to get her life on the right track. And then there’s Lily, whose loose morals are uncharacteristic of her time. With a reputation for having affair after affair, her nonchalance about sleeping with other men is troublesome. Lily seems to do it out of habit, gaining little from these intimate moments, which would somehow make them more excusable. Perhaps this is Didion’s way of saying how easily we take advantage of what we have, with little to gain by putting everything on the line. There are many references to the unbearable weather near Sacramento; it’s either exhaustingly hot or raining, and we get many scenes of Lily alone, shut up in her bedroom against the heat, some liquor or another on her bedside table. In fact, most of the women in this story drink alcohol like they’d drink their tea – anytime of day will do. It sometimes reads like a Desperate Housewives of the 1940s and 50s, full of gossip, ill intentions and forbidden love triangles. Despite Lily being somewhat unlikeable, her characterization and the novel’s plot in general, strike me as a realistic view on the difficulties of living up to society’s, your parents’, or even your own expectations. I particularly like that Didion lived through the 1950s, and has a more visceral understanding of what that meant. Although I am enamored by many historical pieces about the post-war era, they are often written by people who never lived those moments. And Didion’s no-nonsense style of storytelling is typical of all her work – she effortlessly characterizes the truths of human nature, all the good, the bad, and the ugly. At times, the novel is unnecessarily complicated, but I chalk this up to it being Didion’s first novel, before honing her craft. So what did the river and those lights represent in the end? The rain, the river, the cycle of life and that we are destined to repeat our ancestors’ mistakes? Maybe. The car sinking in the river, its headlights slowly fading away – the extinguished American dream? Perhaps. 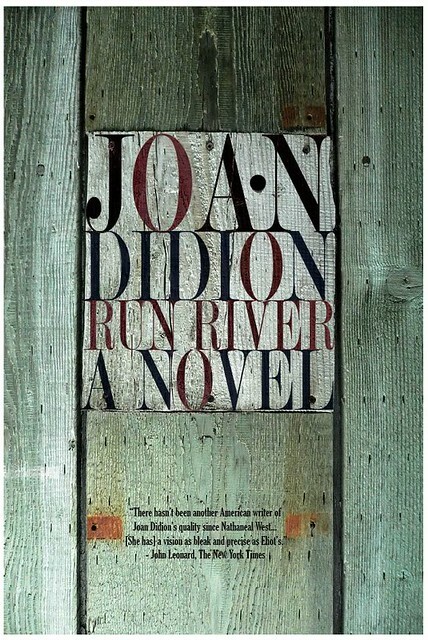 Regardless, that image will forever stay with me, and it will keep bringing me back to the merits of Joan Didion and Run River.